Mala Ganguly has been singing chants from her early beginnings as a seeker who hails from Calcutta. This album is a humble and deeply devotional collection of bhajans (chants) that are bathed in authenticity and nectar. Ganguly’s virtuosity is stylistically reflective of the chanting styles one hears out of India with trained North Indian inflections and unpredictable arrangements. Under the tutelage of many great Indian singers – such as Himaghna Roy Chaubury and Sudhin Das Gupata, Mala Ganguly has a voice that can go anywhere her spirit wishes. Malaji’s voice embodies a classic nasal “Ma” voice and, if you just focus on her singing, this album has a lot of bhakti nourishment. The western instrumentations that accompany her on “Sita Ram” tend to get in the way of the energy though. There are a lot of distracting funky bass lines and electronica grooves that just feel a bit unnecessary when you have someone like Malaji carrying the melody. The “Chalo Mana Ganga Jamuna” bhajan features interesting violin tracks to accompany Malaji’s devotional voice and harmonies. I cannot get enough of Malaji’s phrasing and inflections. She has that ability to move on top and through the melodies with a sense of ease, grace and serenity that most western bhajan singers can not hold a candle up to. “Hara Shiva Shankara” delivers more of the same amazing singing performances while the percussion and instrumentation arrangements tend to keep the shakti contained in electronic materialism. What a wonderfully diverse and multi-faceted journey through many musical hues! Awaken Me, by the uber-talented Kimberly Haynes, offers a spectrum of “Songs from the Heart of a Seeker” woven through a tapestry of world instruments. Dreamy but certainly not sleepy, Kimberly has a voice that is, in turn, prayerful, inspirational, sacred, sassy and passionate. Always uplifting and often quite illuminating, Awaken Me is produced and arranged by Kimberly and David Vito Gregoli, and features contributions and performances by an array of contributing artists that includes pianist Peter Kater, vocalists Tina Malia and Aeone, Native American flute player Al Jewer, and percussionist Byron Metcalf. Didjeridu master Stephen Kent, percussionist Christo Pellani and Gregoli’s guitars galore round out the sound. Singer/songwriter Haynes draws from various musical styles to create a beautiful mosaic of authentic and joyful stories. References to artists such as Joni Mitchell, Shawn Colvin, Alison Krause, Sarah McLachlan and other well-known singers are easy to make. Kimberly marries her soulful voice and compassionate heart with beautiful melodies and lyrics that guide and encourage the listener to a path of healing and wellbeing. This album is full of beauty and heart, inviting the listener on a soulful journey of discovering the sacred space within and creating a conscious connection with spirit. There are equal parts magic and mystery throughout the music that traverse many styles, genres and expressions. Chants are interspersed amongst devotional ballads that chronicle a profound and personal spiritual journey. From the very first notes of the title track, “Awaken Me,” you can feel that Haynes is leading the listener into a space of great reverence. The message of the album is hopeful, worshipful, and above all, one of personal growth and empowerment. The recording is in three parts: “Saguna,” “Nirguna,” and “Pranava,” with each segment running about twenty-two minutes. The music is intended for yoga, meditation, massage, healing and relaxation and really wasn’t created as musical entertainment. Gregoli, a Buddhist who has practiced yoga and meditation for many years, appears on a variety of guitars, dobro, esraj, keyboards, voice, bass, piano, and percussion (impressive!). Ricky Kej adds strings, keyboard, and the Om chants; Kimberly Haynes provides vocals on “Nirguna”; and Christo Pellani plays percussion. Om Land begins with “Saguna,” which means “with attributes.” “Saguna Brahman” implies that God has a name, form and other attributes. For this track, Gregoli chose a nylon-string guitar for its soft and gentle tone. Combined with the light percussion, strings, and Om chanting, this track is quietly hypnotic and very peaceful. “Nirguna” translates as “without attributes” and “Nirguna Brahman” implies that God as the Absolute Spirit and Pure Consciousness has no name, form or attributes. For this track, Gregoli chose a dobro, an instrument often used in country music and similar to the Indian lap-steel guitar. The piece is a bit darker in tone and somewhat mysterious, and Haynes’ voice adds an exotic contrast to Kej’s earthy chants. “Pranava” means “cosmic sound” or “Om” – the sound that everything in all of existence makes if one hears it all at once. It is said that Om comes the closest of all sounds to what this hum of the universe is. For this piece, Gregoli uses a finger-style acoustic guitar that gives the music a special voice that is both grounding and ethereal. Om Land is available on iTunes, Amazon and Dharmapala Records (Vito’s website). The album is both beautiful and extremely well done! Single Shots – Yoga Heart Healing is a collection of five “re-imagined” tracks that originally appeared on David Vito Gregoli’s 2006 release, Yoga Heart Healing. Presented in a shorter, more radio-ready format, the tracks concentrate the relaxing and meditation-enhancing power of the original recording. The first four tracks range in length from just under six minutes to just under nine, and the fifth is a compilation of the first four, clocking in at 27’49”. Gregoli produced and performed all of the music, which is ambient in style and very diverse in instrumentation. Gregoli is a versatile and exceptionally talented multi-instrumentalist, and it isn’t always apparent which instruments are sampled and which are the “real” thing. Gregoli refers to himself as a “sound painter” and these richly-layered tracks are colored in darker hues that are soothing, healing and relaxing. The first four tracks are titled “Asana Single Shot #1-4.” According to Wikipedia: “In the practice of Yoga, Asana denotes the art of sitting still and also any posture useful for restoring and maintaining a practitioner’s well-being and improving the body’s flexibility and vitality, cultivating the ability to remain in seated meditation for extended periods.” The stillness and openness of the music suit this definition very well. The mind is freed to drift through the vast darkened spaces of the music or to focus on thoughts other than the sound itself. Often mysterious and intense, but never threatening or scary, I can imagine some of this music being used in a film soundtrack or as an accompaniment for other visual media. It is strongly distinctive yet easily recedes to the background, not calling attention to itself – a fascinating mix! Single Shots – Yoga Heart Healing is available for download from CD Baby, iTunes and Amazon. Check it out! In the follow up to his multi-award nominated album Primordial Sonics, which I had the pleasure of writing about, guitarist/producer David Vito Gregoli, revisits the familiar landscape of world fusion music, but with a slightly different focus this time. On Om Land, Vito, as he is best known, delves deeply into one of the most primordial vibrations of all – the sound of Om. Stemming from ancient Eastern spirituality, Om is said to be without beginning or end, and embraces all there is. Finding a perfect collaborator in GRAMMY winning recording artist/producer Ricky Kej of India, along with singer Kimberly Haynes and percussionist/sound healer Christo Pellani, the album is a musical meditation on the divine sound. When I asked Vito about his connection to new age music, he replied: “I’ve always done ‘new age’ music. I just didn’t call it that then. I found an old cassette from 1976 and it was a very pre-Windham Hill-sounding piece. I had no idea anyone would be interested in this stuff. LOL.” And speaking of Windham Hill, artists such as Will Ackerman, Michael Hedges, Alex de Grassi, and Michael Manring were major influences on Vito. The album contains three extended tracks that are slightly over 20 minutes each. The first one is entitled “Saguna.” It begins, as do all of them, with the chanting of Om and deep Indian-style drone background. Over that is layered Vito’s nylon string acoustic guitar playing both Eastern and Western-influenced fills. It’s an interesting contrast, and not one that is commonly heard, but it is quite a nice combination. Another contrast here, and on the album in general, was a yin-yang balance between spaciousness and density. The background is densely layered with its chanting that ebbs and flows, the continuous drone sounds – both Eastern-style and sustained synthesizers, and bass notes. All of which add nicely to the deep mystical and meditative nature of the music. The spaciousness is in the guitar parts, which are more minimalistic and used sparingly in the mix. Vito is an excellent guitarist, and as someone who also plays sitar he has a good understanding of Eastern and Western music and scales. As the song evolves, percussion and synthesizer sounds are added. By the time this first track ended, I was totally in the zone. At this point, I want to make clear that the music on Om Land is extremely meditative. It is created for going within and accessing deeper states of consciousness and inner peace. This is not made for entertainment as most music is – perhaps the word “entrainment” would be more appropriate. By nature, there is a consistency in the drone and background sounds that serve as a vehicle for meditation, yet within that, there are subtle changes and variations that come and go slowly as the piece unfolds. When one is in a deep contemplative state, the continuity of this kind of music is perfect to help maintain that flow. I also found that listening with headphones made for an even more immersive experience, and I highly recommend that. According to Vito: “The second track, “Nirguna,” is more modal and based around a synth theme Ricky provided, and a variation I did on it with the Dobro and piano. Towards the latter part of the tune I brought in Kimberly Haynes singing an almost shamanic style vocal and in the piece’s climax I add the Bengali esraj, which is both plaintive and highly evocative.” Incidentally, an esraj is a stringed instrument that looks a little like a sitar but is played with a bow, like a cello, and has a haunting sound. An interesting addition is a bouncy electronic sequence that adds both motion and a contemporary feel. There is also another very occasional sound texture that I’m told was used to add a modern electronica vibe which I didn’t care for as much, but it’s a matter of taste. Perhaps I’m just old-school. However, all in all it’s a powerful piece and the female vocals add an ethereal air that is truly transcendental as they blend with the chanted Om vocals. The third track, entitled “Pravana,” features Vito’s fingerstyle steel-string acoustic guitar as the solo instrument. He also plays bass, hand drums, piano, synths, and esraj on all the tracks. In addition to Vito’s drumming, Christo Pellani’s percussive ‘colors’ are heard thru out the album. While there is similar style to the three tracks, anchored by the Om chant, each one also has its unique characteristics that distinguish it. But, once again, this is music for meditation, and maintaining that space is its ultimate goal. I really liked the fact that when I started listening to a track, I knew there would be a continuous uninterrupted flow that would carry me through the piece without any sudden changes or shifts. And I did appreciate the subtle vocal and instrumental variations that drifted in and out creating musical interest, but not distracting from the meditative ambience. Another thing I liked about the album is that one can listen to it in its entirety or just tune into one track for a 20-minute spiritual recharge. I see Om Land as a tool for introspection more than as something to listen to casually. While I greatly enjoyed the experience, I just had to make sure my feet were touching the ground after I got up from listening! 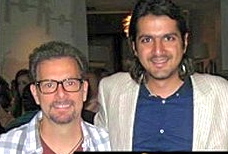 Yet beyond the music itself, I have tremendous respect for artists like David Vito Gregoli and Ricky Kej, who use their artistry for the purpose of both inner peace and global peace. Their music is about uplifting and inspiring people, and in some small way, making this a better place. Om Land is a deep and powerful listening experience that can take one beyond their normal waking consciousness to an attunement with a primordial and universal vibration. And that’s certainly something we could use more of in today’s world. OM. “Without beginning or end, OM embraces all that exists” says David Vito Gregoli, award-winning producer/guitarist. In this gorgeous and luscious work, Om Land, Gregoli collaborates with percussionist/sound healer Christo Pellani, singer Kimberly Haynes, and multi-instrumentalist/producer Ricky Kej to produce a meditative journey that you don’t want to end. There are three luscious tracks on this album, ‘Saguna’, ‘Nirguna’, and ‘Pranava’. Each piece, anchored by the chanting of Om, includes layers of melody and instrumentation that glide within their own unique expression of Infinity. ‘Saguna’ begins with Gregoli’s sweet guitar melody grounded by a gorgeous tambour drone and supported by Christo’s ever inventive percussion, added are beautiful strings, keyboards and even Esraj. Within ‘Nirguna’ we are drawn into deep contemplation as the ever present Om chant, courtesy of Ricky Kej is complimented by Haynes lilting vocal and Christo’s layered percussion. In ‘Pranava’, a gorgeous Sarangi greets us followed by Gregoli’s richly delicate guitar all gliding above a steady and tasteful percussive presence. This expertly produced work is to be savored and listened to over and over again as it helps evoke a sense of wonder and bliss. If you’re looking for music to meditate deeply to, this is an excellent choice. Whole Life Times Review "Om Land"